Eileen Christelow’s Vote! has everything you need to know about voting and how our democracy works—parties, voter registration, campaigns, rallies, debates, Election Day, even recounts! Topics are presented in a clear, kid-friendly graphic format as the story of a local election unfolds, with hilarious commentary by the candidates’ pets. Includes updated back matter for the 2018 midterm election. 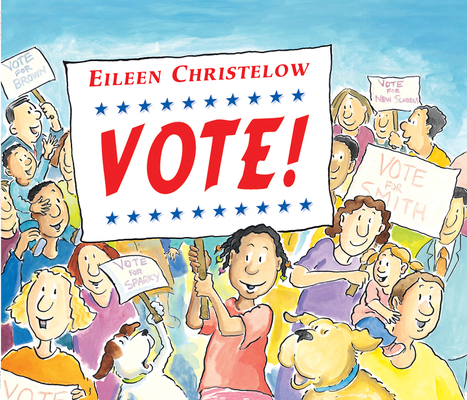 Eileen Christelow has written and illustrated numerous best-selling picture books including ten popular stories about the Five Little Monkeys, Vote!, and Robins! : How They Grow Up. She lives with her husband in East Dummerston, Vermont. Visit her online at christelow.com and fivelittlemonkeys.com. Now you can buy digital audiobooks and support Lift Bridge at the same time! Click the image above to start shopping.